I gained most of the important skills needed for a research career in marine science: lab experience, at-sea experience, analytical experience, writing experience as well as managing my time and thinking independently and creatively. 1. What made you choose the degree you studied? Growing up in the Caribbean, I was never exposed to deep-sea science so when I took Professor Paul Tyler’s deep-sea biology class during my MSci at the Southampton, I was instantly hooked. When I was a kid, I wanted to be an explorer (I mean, who didn’t right?!) and here was Professor Tyler telling me that the world’s largest habitat was mostly unexplored. Doing deep-sea research was my chance to be a real-life explorer so I decided to apply for PhDs. 2. What made you select the University of Southampton to study that degree? As I had done my undergraduate degree at the University, I was sceptical about continuing my studies in the same university but despite applying elsewhere around the world, I ended up choosing the Southampton for multiple reasons. It was one of the best universities in the UK for marine science, the leader in deep-sea science, and home to a suite of great tools such as the UK Remotely Operated Vehicle (ROV) Isis. But the two tipping points for me were that there was a great PhD project being offered jointly with the Natural History Museum in London and that I was offered a Graduate School of the National Oceanography Centre Southampton (GSNOCS) scholarship. As an international student, this made doing my PhD a possibility and I have no regrets about going to the same institution for both my undergraduate and postgraduate degrees. 3. What did you enjoy most about your degree? Splitting my time between the National Oceanography Centre Southampton and the Natural History Museum in London. I was able to get the experience of working at two very different institutions, one which was more of a teaching environment and the other, more research and science communication focused. 4. What opportunities did you take up that really added value to your experience as a student? There are lots of opportunities to travel during postgraduate research but especially in deep-sea science! I was extremely fortunate that I got to go on seven research expeditions around the world during my PhD. Not only do you get to visit new places but the experience of living and working on a research vessel for weeks at a time is one that few are lucky to have. I was fortunate to be among the first people on the planet to see some areas of the deep sea that we were working in. 5. How did your studies and experience at Southampton shape your future? I gained most of the important skills needed for a research career in marine science: lab experience, at-sea experience, analytical experience, writing experience as well as managing my time and thinking independently and creatively. I had two great supervisors that passed lots of great opportunities my way as well as nurtured me professionally. Also being affiliated with two research institutions meant that I had a large professional network, which was of great assistance when I was looking for postdoctoral positions. 6. When you graduated what were your career ambitions? I was fortunate to have already secured a postdoctoral position so I really wanted to excel in that role and not disappoint my new boss! 7. Where are you working now? Since September 2013, I’ve been a postdoctoral researcher at the University of Hawaii at Manoa, as well as the Assistant Project Manager of the ABYSSLINE project. 8. Tell us about your current role? As a researcher, I am investigating the baseline characteristics of the megafaunal community that inhabit the Clarion-Clipperton Zone in the Pacific Ocean. This is an area where deep-sea mining for polymetallic nodules could take place in the next decade or so. It is also somewhere that we know very little about biologically. As a manager, I am responsible for the coordination of the international network of ABYSSLINE scientists. This includes: managing cruise and meeting logistics, as well as facilitating communication channels and collaboration between multiple stakeholders including industry, policy makers, and scientists. 9. Do you have any future ambitions? I have been lucky to have many incredible learning experiences and now I would like to impart those experiences with as many people as possible. In the short term, I hope to return to my home country, Trinidad and Tobago, to help increase marine education and science communication in Trinidad and throughout the Caribbean. During this time, I’m also going to be applying for fellowships as I ideally would like to continue with research but this time, design my own project and secure my own funding. As deep-sea mining is a very real possibility and may have a large impact on the world’s oceans, I would like my research to consider focusing on this issue. 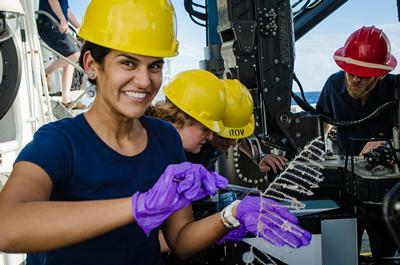 Recently, I was able to take part in the ‘Deep water Exploration of the Marianas’ expedition aboard the NOAA Ship Okeanos Explorer as the Biology Lead. The goals of our expedition were to explore unknown areas of the Marianas deep sea, share the acquired knowledge with others, and to encourage the next generation. This was done using a fantastic ROV, Deep Discoverer that acquired stunning footage, which was viewed live by a global audience of scientists, marine explorers and members of the public in real time. It meant that everyone could share in our discoveries with us! During our expedition, the live feed had a record-breaking 2.7 million views, we interacted with 52 scientists from around the world, and we did many live interactions with students and members of the public while at sea and in port. It was great to be part of such a fantastic operation, which is no doubt inspiring the next generation of scientists and engineers while also collecting crucial information about the deep sea. During my PhD, my Southampton supervisor, Dr Jon Copley, had a collaborative project with JAMSTEC working on hydrothermal vents in the Cayman Trench. This allowed myself and another PhD student to take part in an expedition on the R/V Yokosuka for three weeks in the Caribbean. Apart from the plus that working on a Japanese ship was a fascinating cultural experience full of great people and even better food, I got the opportunity to dive down to 2.5 km depth in the submersible, the HOV Shinkai6500 at the Cayman hydrothermal vents. This was one of the best experiences of my life! Actually being down there and seeing everything with your own eyes, rather than through the cameras of an ROV, was unforgettable and fantastic beyond words! 11. What makes your current role unique? As deep-sea mining is a new issue, there are few other projects doing the research that we are, which can be daunting but also very exciting! The area of the Pacific I work in is also extremely unexplored, so we are discovering lots of new species using cutting-edge ocean technology like AUVs, ROVs and landers! This project, which I am very lucky to be a part of, will help to inform the management of a very vulnerable area of our planet! It’s also great because I get to collaborate with other scientists all around the globe (which means lots of travel), as well as work with private funders from industry, policy makers and other stakeholders. 12. What advice would you give to a student starting their degree at Southampton? Seize every opportunity that may come your way, professionally and otherwise. There will be many and these can end changing the course of your life for the better sometimes! Also, join an intra-mural sports team or club. This is a great way to make friends, get exercise and stay sane when the PhD gets stressful. 13. If you had your time at University again is there anything you would do differently? I regret not taking part in the one of the many great exchange programs that Southampton and NOCS offer. During my undergraduate degree, there were opportunities to go to the University of North Carolina Wilmington for a semester, as well as to British Columbia on summer job placements through the university. And during my PhD, there were opportunities to do research for three months at another great oceanographic institution like WHOI, MBARI or SIO. 14. What tips would you give to current students looking to start a career in your sector? Get as much experience as you can, whether it’s doing beach clean ups, volunteering at your local nature centre etc. Also keep an eye out for internships at museums and other great institutions. This can help you get a handle on what you may actually want to do when the time comes to decide on research projects etc. Keep abreast of issues in your field – social media can be a great tool for doing this as well as networking with scientists that use it.